Thanks for purchasing ThoughtOffice Brainstorming Software. First, you’ll need to install the software to your computer. The file you downloaded is the installer program. Windows users – click here for a video and installation instructions. IMPORTANT: ThoughtOffice needs to be installed to the default folder specified by the installer – C:\Program Files\ThoughtOffice. Mac users – click here for a video and installation instructions. IMPORTANT: ThoughtOffice needs to be installed to the Mac Applications Folder. Congratulations! If everything has gone well, ThoughtOffice is now installed on your computer! 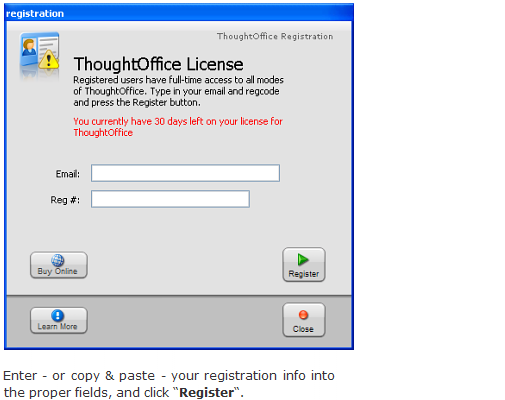 And don’t forget to download the Introductory Guide to ThoughtOffice. This PDF will help you get the most out of the program.